Jason Kozak enters his third full season at the helm of Virginia Elite, taking over as President in April of 2016. Kozak comes to Elite after a two-year stint as the Head Coach of Saint Francis University and brings with him an impressive background of 16 years of collegiate coaching experience, eleven of which were at the NCAA Division I level. During his tenure as a college coach, Kozak was very familiar with Virginia Elite’s training and recruited several Elite athletes to his programs. While at Saint Francis, Kozak coached the Red Flash to a winning record in the Northeast Conference and brought them back to the NEC Postseason Tournament as the third seed. Two players under his guidance earned All-NEC recognition. Additionally, several Red Flash players broke SFU records in 2014. In 2012, Kozak guided the NCAA Division II University of Charleston Golden Eagles to a 16-16 mark and a berth in the West Virginia Intercollegiate Athletic Conference postseason. His 2013 squad improved to 22-9 and posted a 12-4 record in the newly-formed Mountain East Conference. The Golden Eagles, which dominated with a 74-37 edge over their opponents in sets won during the regular season, advanced to the MEC semifinal round. In 2012, Charleston’s team accumulated six WVIAC and MEC All-Conference selections and earned a team academic award from the AVCA. Prior to his time at UC, Kozak spent two years as the head coach at Hollins University in Roanoke, Virginia, where he oversaw the program as it reclassified to NCAA Division III status. At Hollins, he led a young squad to the second postseason tournament appearance in program history before joining the Charleston staff. Kozak coached at the University of Virginia from 2002 to 2008, where he mentored five NCAA All-Americans, five All-Region selections, and 10 All-Conference selections. He helped the Cavaliers to a 114-77 record while posting 18 or more wins in each of his final five seasons. His 2006 squad finished second in the Atlantic Coast Conference with an overall season record of 23-8. Kozak was Virginia’s recruiting coordinator in 2007 and served as the director of the University’s Volleyball camps beginning in 2005. While in Charlottesville, Kozak also served as the Technical Director of the Charlottesville Area Volleyball Club. Kozak also brings experience as an assistant coach at Appalachian State and at the University of Pennsylvania, where he assisted in coaching the Quakers to a 2001 Ivy League Co-Championship and NCAA tournament appearance. Kozak currently resides in Rochester, New York. 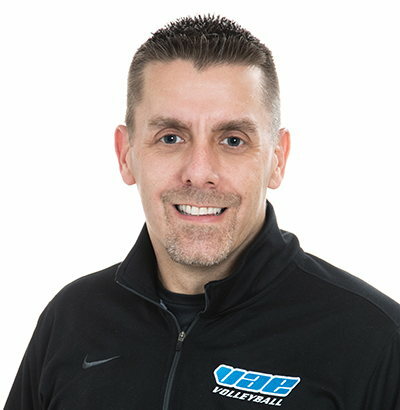 He is a 1997 graduate of The College at Brockport and a member of the American Volleyball Coaches’ Association.